It is with great pleasure that I take this opportunity to place on record my gratitude and appreciation to Aaron Legal of Richmond for their recent conveyancing assistance during the sale of my Parramatta unit. The matter was attended to efficiently and with a minimum of fuss while I was kept informed throughout of it’s progress. Lisa’s quiet efficiency contributed to a successful outcome. However, I must make particular mention of the assistance given by Pamela who, when faced with circumstances brought about by the mortgage provider at the eleventh hour prior to settlement, arrived at an ingenious solution which allowed the matter to proceed as scheduled. I have no hesitation in recommending Aaron Legal to anyone requiring a professional and efficient conveyancing service. I want to thank Aaron Legal for all the assistance you have provided my husband and I in the sale of our property at Kellyville Ridge. Through the whole process, regardless of who I spoke to, I felt that I was completely informed and everyone was up to speed with the progress of our sale. Selling a home can be stressful and your team made the process so easy and painless, assisting with the creation of a power of attorney when my husband proceeded interstate prior to the sale and completing the final sale process without a hitch once I had moved interstate prior to settlement. Your team has been an absolute joy to deal with and I have no hesitation in recommending Aaron Legal for conveyancing services. Thank you again for your wonderful service and assistance in selling our property. I would like to thank you all for your professional, courteous, friendly and extremely efficient service. I haven’t had a great deal to do with solicitors but would definitely recommend your services to anyone who needs your assistance. Right from the moment I called, I knew that I had made the right decision with my choice of solicitor. I was very impressed with the way things were handled and was always kept in touch with how things were progressing. Even though I live interstate I know that I will be needing a solicitor again in the future and I will have no hesitation is calling upon your services. I would like to take this opportunity to tell you what a thoroughly outstanding job you have done for me personally and my family. I am very pleased with the performance, support and professionalism of your conveyancing staff Suzanne and Jo. They were always prompt with answering all my questions and concerns. I would not hesitate in referring them to friends and colleagues. 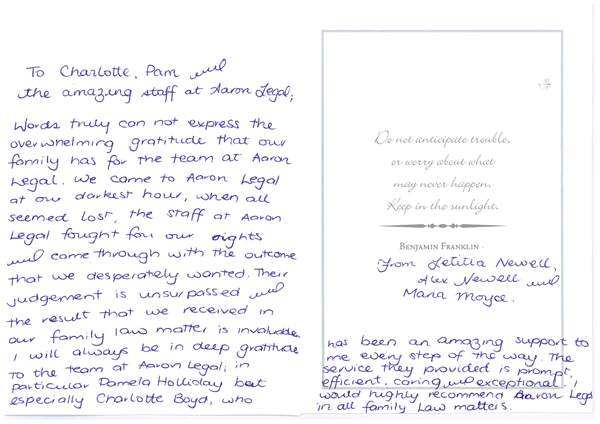 A big thank you also goes to Charlotte and Pam, in dealing with my family law matters. They were both very quick to respond, made themselves available during times that most would consider after hours and they were patient in explaining the status and details of my case. I sincerely appreciate all of the help and professionalism shown by the staff of Aaron Legal. Also a big thankyou to Roger your excellent customer service skills are exemplary. You are an asset to the staff of Aaron Legal.